Yesterday whilst in the background of Mother’s day we were busy selling jewellery, cakes, Easter Eggs, and raffle tickets, all in the aid for our chosen charity of the month ‘The Forget Me Not Trust’. Over last couple of weeks we having been planning away different ideas to approach fundraising and this was the most popular one. Around the corner were some beautiful cakes all waiting to be eaten, including scones, cupcakes, cookies, shortbread, fruit loaves, lemon drizzle cake slices, chocolate cake, ( The list can go on and on). 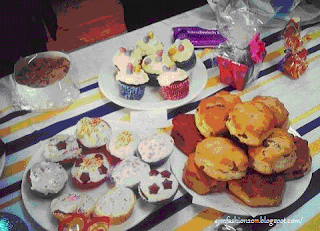 All baked with helping with mums, grandmas, nana’s… A result came and they all went. Massive thank you to everyone who baked those yummy cakes! Finally onto the last stall was some beautiful handmade jewellery. These little treasures came into tear drop earrings, bracelets were beautifully made out little detailed shapes and materials of coral, beads. (Perfect accessory) necklaces were also made a statement on the stall. After a morning of raising money through varies yummy and beautiful objects... Finally it was time for the grand total from this event, totalling up to £100.53. We won’t be stopping there we are still waiting to get everyone’s jars in filled with 5p, 2p, 1p, at the middle of April. On the 27th March we will be visiting Forget Me Not’s new building.